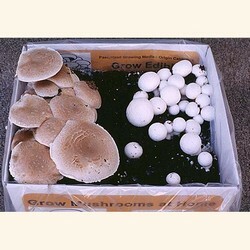 Portabella / Crimini and White Button Mushroom Kit from Mushroom Adventures. Grows mushrooms at home. This lovely mushroom growing kit is for the person who cannot make up there mind what to purchase. It contains two mini mushroom kits boxed together. A mini White Button and a mini Portabella kit. They are boxed together and shipped as one kit. The photo of this product shown here is of our old stile version of the kit made as one box. For further descriptions and information see below. Pricing and outer box options maybe viewed below. Shipping charges are calculated at time of check out. ½ Portabella & ½ White Button mushroom kits contain a mini White Button mushroom kit and a mini Portabella mushroom growing kit.. The two mini kits are packaged together in a plain brown box about the same size of a regular mushroom kit, and have both varieties inside. One of the kit grows Portabella and the other side of the kit grows White Button mushrooms. When they fruit there is often a few days difference in maturing time between the two varieties so all the mushrooms don’t fruit at the same time. The current photo shows an older version of the 1/2 white and 1/2 Portabella kit. No matter what they are called they taste great. The kit is complete all you add is water. Kits are time sensitive and should be started within 10-21 days after there start date. Start dates can be delayed if the kit is refrigerated. These mushrooms are grown on pasteurized compost and do not smell. All mushroom kits can to some degree attract small fungus gnats this is normal. Shipping charges are calculated at time of check out. Mushroom Kit Dimensions: Length 13",Width 11",Height 9". Shipping Weight: 13lbs. / Grows up to 4 lbs. of mushrooms total. Available from September 15 through May 10.